China's Chen Zhong delivered Chinese delegation a perfect happy ending Sunday, winning its 32nd and final gold at the Athens Games in defending her Olympic title in taekwondo women's over 67kg class. 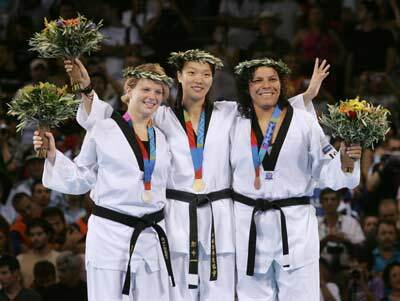 Chen, in Athens, repeated her personal record of savoring the delegation's gold conclusion at Sydney 2000 when she made history by claiming the delegation's first ever Olympic taekwondo gold. In the final on Sunday, the 21-year-old Chen beat Myriam Baverel of France 12-5. Baverel, a 23-year-old German language teacher, finished second in the middle weight 67-72kg at the World Championships 2003, Garmisch-Partenkirchen, Germany. The bronze went to Adriana Carmona of Venezuela in beating Natalia Silva of Brazil 7-4. Earlier the day, Chen kept her winning run by defeating Silva of Brazil 8-5 in semifinal and Adriana Carmona of Venezuela 7-5 in quarterfinal. During the semifinal, Chen, who earned her Olympic gold in the same category in Sydney, fought a close round one but prevailed in round two and three, scoring one points, four points and three points, respectively. At one point in round three, the 30-year-old Silva struck Chen' s head and earned a much coveted two points. But Chen's later strong showing proved that was only a temporary surprise. In another semifinal, Baverel scored five points in three rounds but had two points deducted after receiving four kyong-gos (warning penalties) in beating Nadin Dawani of Jordan 3-3 in another semifinal. Chen cruised into the match after beating Adriana Carmona of Venezuela 7-5 in the quarterfinals earlier the day. In the quarterfinal, Chen kept a steady pace throughout the three rounds and prevailed, scoring two points in round one, two points in round two and four in three. But she had one point deducted after receiving two kyong-gos ( warning penalties). Chen defeated Yoriko Okamoto of Japan 7-5 to progress into the quarterfinal earlier Sunday. The 31-year-old Carmona, who had finished fifth in the heavyweight over 70kg at the World Championships in 2003, won by superiority 8-8 over Sarah Stevenson of Britain. The program of the final day of Olympic taekwondo competitions featured the women's over 67kg division and men's over 80kg, with top athletes from all over the world providing a spectacular finale. As a martial art sport, taekwondo became an official sport at the Sydney Olympics after participation in the 1988 and 1992 Games as a demonstration sport. In recent years, taekwondo has become a modern amateur sport and has maintained the tradition and spirit of martial science. Today, taekwondo is one of the most popular international sports, being practised in 157 countries and regions with more than 50 million participants throughout the world.